There have been many unexpected benefits of my recovery. The most important of these has been the unconditional love and support of my family. Many months after I stopped drinking, I received a gift and the letter below from my daughter. 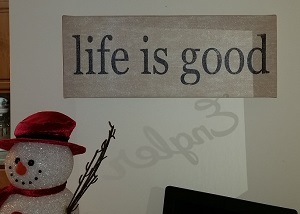 The gift that she refers to still hangs in my living room, a visual reminder of all that I have gained and all that I enjoy by choosing recovery. It is very difficult to explain to someone what it feels like to “have them back”… especially when they have always been there… physically. August was a rough month for all of us. It was also a defining breakthrough in what Collin and I have dealt with for 25 years. For as long as we have remembered, your relationship and behavior with us (your kids) was entirely dependent on the probability that you had been drinking on that particular day. In short…we cannot express how good it feels to have you around…sober. Where you remember our conversations, engage in talks about our interests & life, and where your temper is calm & predictable. Collin & I are so proud of you Dad. And we love you very much. We will always be here for you & support you in any way & I hope you truly know that. Inside this box is a gift… & you should hang it somewhere that you will see it every day. It will serve as a reminder of all the good things you have to be thankful for…including your health, your kids & your life (sober)! In recovery now for over five years, I am able to appreciate how good life really is. I’m amazed at the progress that I have made in my life, stretching the boundaries of my comfort zone and exploring new challenges that to many may seem extreme, like skydiving. I have friends who cannot fathom the idea of skydiving. I once had serious reservations myself and was amazed at how easy it was to jump out of an aircraft, once I had my thoughts and feelings in check. (Thanks, SMART!) What an awesome skillset I’ve learned for the second half of my life. Each of the activities and challenges that I’ve pursued in recovery has enlightened my life by some measure and I can’t begin to imagine what my life would be like now if I hadn’t got my act together. Lying in the hospital I knew that I alone was responsible for my situation and I only had myself to dig out of it. The personal support and tools for recovery that I found with SMART gave me encouragement, and more importantly the ability to recognize when I was being successful and when I needed to tweak my approach a little bit. I’m forever grateful and I wish you all a joyous New Year. Because there are millions of families like Chips’s who would benefit from our program to regain their lives, we hope that you will consider giving the gift of recovery by contributing to our annual growth fund before December 31. 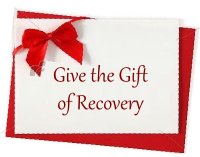 Thank you for supporting self-empowered recovery! Great news! 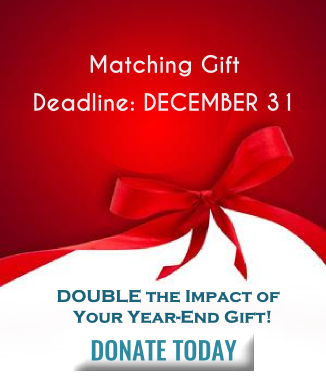 All gifts made before midnight, December 31 will be matched, doubling your impact to support self-empowering, science-based recovery.